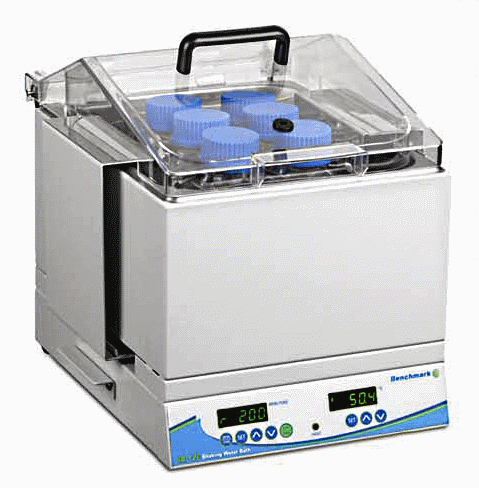 This compact shaking water bath utilizes the well proven, belt-less motor drive system from the popular Orbi-Shaker™ Series, with the addition of precision temperature control up to 80°C. The seamless, stainless steel chamber has a 12 liter capacity and includes a universal spring-loaded platform for securing 15 and 50mL test tubes, as well as Erlenmeyer flasks and media bottles up to 1 liter. A hinged and removable lid is also included to reduce energy waste, prevent splashing and divert condensation away from samples. Easy to use controls allow the user to digitally select and monitor time, temperature and shaking speed, while a constant monitoring system ensures accuracy over each parameter. Optional test tube racks are available for microtubes and custom-designed racks can also be made available by request.